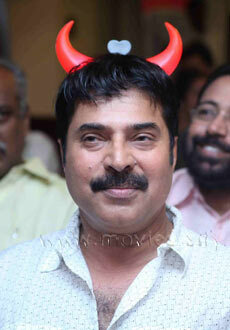 Mammootty Special: Mammootty with Horns! At the audio launch of Mammootty's Pattanathil Bhootham, the actor surprised everybody by coming for the function with a pair of red horns attached to his head! The music of Pattanathil Bhootham, by new music director Shaan Rahman (the guy who made the album ‘Coffee@MG Road’ with Vineeth Sreenivasan) is a hit. The film is now almost certain to release in 111 screens on July 2.